The grass grows high some days in our front yard, and who jumped out right by my feet but a baby rabbit. I call him Bun bun. My husband Peter refers to him as Wilbur. Our Annapolis neighborhood, a 20 minute walk from City Dock, is teaming with wildlife. Bunny rabbits skirt their way across the streets at dusk, families of mallard ducks select the secluded side yards of homes on the banks of Spa Creek to build their nests. A blue heron searches for breakfast at Old Woman’s Cove at daybreak, while squirrels busily dig up the spring bulbs I planted seeking nourishment for themselves and their babies. Each morning leaving for my walk, I eye my one tomato plant with tomatoes (purchased at the Farmers’ Market) to check no one has been nibbling at its fruit. The leaves of my basil plant are mysteriously absent. But it’s in a pot, and I have no witness account of a creature sampling its minty flavor. With such a large population of rabbits, it’s not surprising to also see a handsome red fox steathily walking about in the evening near Maryland Hall for the Creative Arts. Everyone has to eat. What’s next, coyottes? Has anyone seen any recently? I was driving down the road today, Mother’s Day, a little over the 65 mile per hour speed limit, and I started to wonder why am I driving so fast? If I wanted to conserve on fuel, I should be driving 55 miles per hour. Everyone knows that once you exceed 55 mph your mileage goes down, or do they? I’m of that age that remembers the oil embargo close to 35 years ago when everyone was trying to conserve– keep the heat thermostadt at 68 degrees, carpool, and drive 55 mph. We reduced oil consumption by as much as 20 percent. What happened? We all became complacent and forgot, brainwashed by the energy companies and now we’ve done so much damage to our planet no one has time to care. We’re all too busy trying to get somewhere quickly. I was on my way from Annapolis to Baltimore to visit my mother. I came bearing gifts, although I wasn’t certain if they were the “right” gifts. My mom has a talent for asking for things as gifts that I just can’t find, although they sound simple enough. She wanted a turtleneck (to hide her ugly neck she told me) but in May a turtleneck is not easy to find other than by going online. But I was running out of time so I bought her a red knit top. I thought it looked nice but she didn’t want it, so that’s another trip back to the store. She did, however love the flowering potted plant I brought her, even though she didn’t want a plant. (I figured the plant would last longer than cut flowers). “The color of the flowers are great,” she told me. Okay I did something right. Here I am, a middle aged woman still trying to please my mother. Meanwhile I’ve received phone calls from both my sons and my daughter was working on my Mother’s Day gift –planting a garden with her dad and making me dinner. (Hope they can keep up that garden!) It doesn’t matter really, at least they put the effort in and as to what they’re serving for dinner? It’s a surprise. Whatever they prepare I’m going to love it! For me the biggest gift is taking the time to slow down, enjoy the green earth while it’s still here, enjoy my family. So maybe it is time to see about getting those speed limit signs changed! If you’re casting about for something to do with your Mom on Mother’s Day and she happens to love musicals and strong women, take her to see Vanishing Point. There’s only one more show left, Sunday afternoon May llth at the Annapolis Unitarian Universalist Church, a production of the Dignity Players and directed by Mickey Handwerger with music direction by Mark Hildebrand. The story is about three famous women who vanished—Amelia Earhart, Sister Aimee , and Agatha Christie. Or did they? Agatha Christie, one of my favorite early 20th century mystery writers vanished for eleven days in 1926. That same year evangelist Aimee Semple McPherson vanished for three weeks. In 1937 Amelia Earhart set out to fly around the world and disappeared on the last leg of her journey over the Pacific Ocean near Howland Island. How are their three disappearances linked? All three actresses—Margaret Allman as Agatha Christie, Wendy Baird as Aimee Semple McPherson, Sheri Kuznicki as Amelia Earhart have lovely voices and incredible stamina as they perform this intense story that draws on historical record and the authors’ imagination. Also opening this weekend is The Goat Or, Who is Sylvia by Edward ,Albee Winner of the 2002 Tony Award at the Bay Theatre Company in Annapolis directed by Lucinda Merry Browne., if you attend this Friday there is a Pre-Show reception. Over at the Colonial Players in Annapolis is Hauptmann and you can read my review in the “Entertainment Blog” on the WhatsUpMag.com website. And if you want to make a visit to Baltimore, The Color Purple is playing at The Hippodrome through May 18th and is excellent. Leading actress Jeanette Bayardelle has a phenomenal voice. While I loved the movie, the staged musical is completely different, equally as poignant and uplifting in a different way. Yes, I am a theater junkie. Good live theater is inspiring and we have plenty of great opportunities to see a wide variety of plays within a small geographic area. The May baskets around town are starting to wilt and fade, but many colorful azaleas and tulips are brightening up the Annapolis Historic District. My favorite time to walk downtown Annapolis is early morning, before it gets too crowded, but for those of you who may live further away, next time you’re planning a trip to your favorite downtown restaurant allow some time to stroll. Spring is a great time to soak up the local scenery. May Day, May Baskets, and Maypoles! We have a blackboard posted on the wall for inspirational messages at our office at What’s Up? Publishing. It’s the first thing you see when you walk in the door. 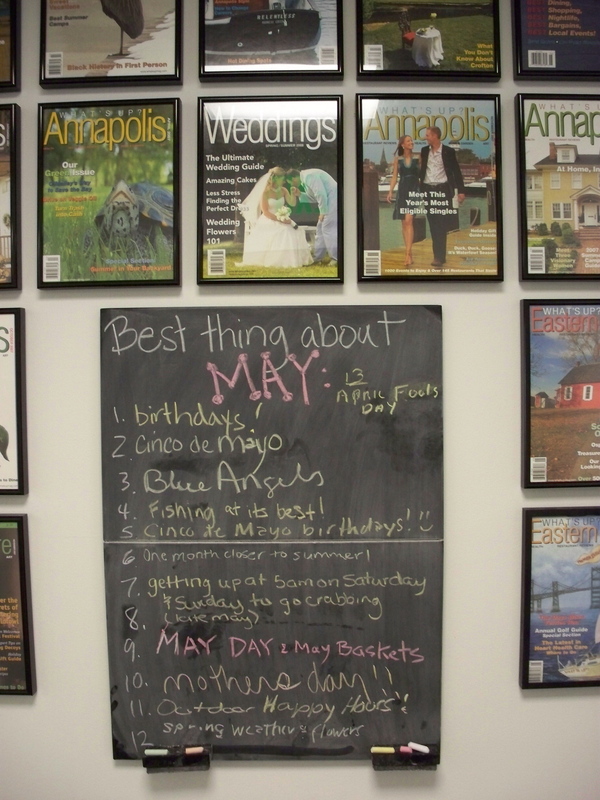 Currently someone has inquired, “What are your favorite things about May?” The responses have included Cinco de Mayo, crabbing season, and warm weather. My entry on the board was May baskets and May Day. My relationship with May Day goes back to elementary school. May Day was the big outdoor pageant we held every year and it was an important school tradition. Every year a theme was selected and each class performed with a song and a dance while siblings and parents watched from the folding chairs set out on the school lawn. The grand finale was the May Pole dance performed by the sixth graders. (This was back in the days before middle school and elementary school went up through sixth grade.) I would enviously watch the girls, with wreaths of flowers in their hair, dressed in pretty spring dresses, holding a piece of the maypole ribbon and weaving it in and out as they danced with their male partner around the tall pole bedecked with colored ribbons and topped with flowers. I couldn’t wait until I was in sixth grade and got to do the maypole dance. I can still hear the theme music in my head, the pianist would play on the old upright they’d wheel outside, as we proudly marched to our seats. After the pageant we’d enjoy refreshments that included peppermint sticks stuck inside of lemons, that tasted delicious and made your hands very sticky. After the picture taking, and the hugs from proud parents, we’d gather our costumes in large brown paper bags and go home, basking in the glory of our theatrical performance. Unfortunately the theme the school picked the year I was in sixth grade focused on Nessie the Loch Ness Monster, recently sighted in Scotland. An exciting tale that included a giant prehistoric sea serpent, the Maypole dancers took the role of being the local Scottish lads and lassies. This meant that instead of wearing a pretty dress, the lassies wore drab plaid kilts as did the lads. Even less romantic then missing out on flowers in my hair was the fact that my dance partner was a girl, because we had several more girls than boys in my class. What a treat to walk downtown and feast your eyes on one after another of beautiful baskets of flowers placed on gates and doorways. I immediately had to make my own. Not that I do it the way you should, strictly with cut flowers. Most of the time, I cheat by placing a pot of geraniums or petunias in the center of the basket and then add sprigs of lilac, flowering cherry, and azalea from my garden. My short cut is of little consequence because I can’t officially enter into the yearly contest held by the Garden Club of Old Annapolis Towne. I live just outside the judging area. 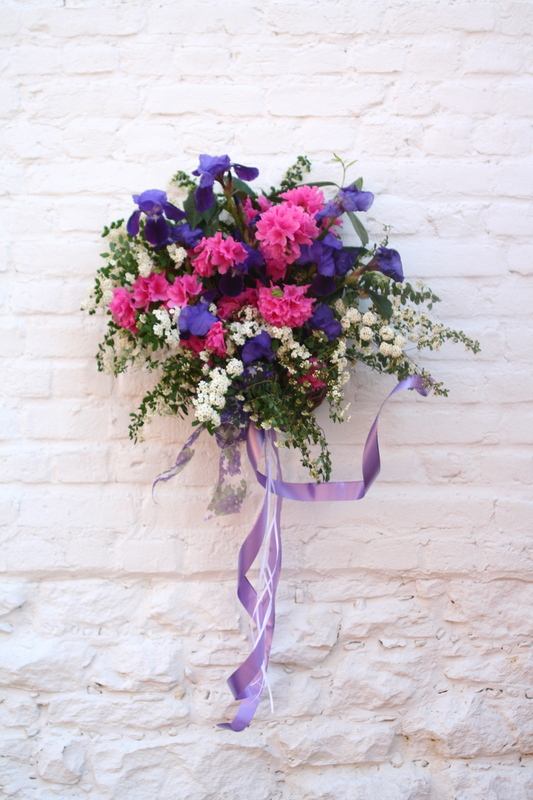 But I also hate to see flowers die so soon and you have to be very skillfull to keep the floral foam hydrated and your cut flowers living in sunshine and warm weather for more than a few days. For information about how to make your own May Basket. Don’t have time to make a May basket of your own? You can buy one as early as 8:30 a.m. from the Four River Garden Club, in time to hang on your door before 10 a.m. when the Garden Club of Old Annapolis Towne judges start making their rounds. 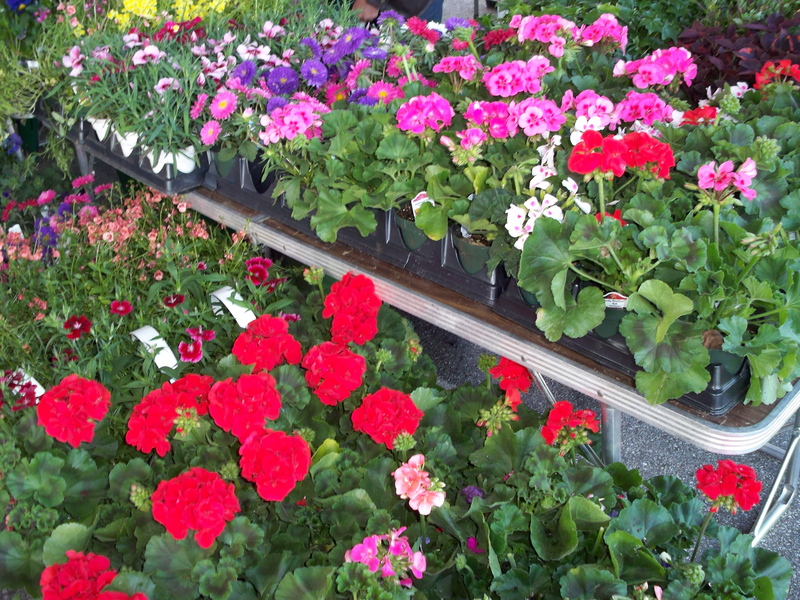 Locally grown perennials, sweet-smelling herbs, colorful annuals, and freshly baked sweets and breads will also be sold at the Four Rivers sale set up in the downtown City Dock area. If you have a child under 12 , encourage them to make a May Basket and it they live in the Historic District along with parts of the Murray Hill neighborhood they will receive a pink ribbon and lollipop. In order to participate in the Old Towne Garden Club contest, all basket entries must contain a name and address card and children’s baskets should list age as well. Other contests and diisplay are now taking place in the neighborhoods of Eastport, Presidents Hill, West Annapolis. Take a stroll on May first and see what you find! Author Nadja MarilPosted on April 27, 2008 May 1, 2008 Categories annapolisTags annapolis, May Basket, May Day, Maypoles, Nadja Maril, What's Up? PublishingLeave a comment on May Day, May Baskets, and Maypoles! “What could you possibly expect to find this early in the season?” my family asked me, three weeks ago when I rushed over to the Farmers’ Market on Riva Road Saturday morning at 8:00 a.m. It was opening day, and like junkie compelled to get my fix, I tore myself away from dog walking and laundry chores, jumped into the car and drove down to see what was for sale at the start of April. I wasn’t disappointed. There were fresh new lettuces, bags of baby lettuce, kale, turnips, carrots, fresh eggs, and lots and lots of plants. This past weekend was week three and while the selection of lettuces has diminished, I purchased freshly picked asparagus and noted an increasing number of baked good stands. The egg stand was already sold out by the time I arrived this week, but if you’re looking to start a vegetable or herb garden there’s plenty of selection to inspire and get you started now that the warm weather has finally arrived. Last week I purchased what is called a “lettuce bowl,” a very large pot planted with a variety of greens that you can pick approximately four times. It has provided lovely fresh greens for my salads all week long, and as long as I continue to remember to water it, should provide us with added ingredients for fine salads for another few weeks. After having work issues on my brain twenty-four/seven, it’s a treat to focus on the textures and colors of pale purple turnips and bright pink geraniums plus the farmers and vendors are fun to talk to. 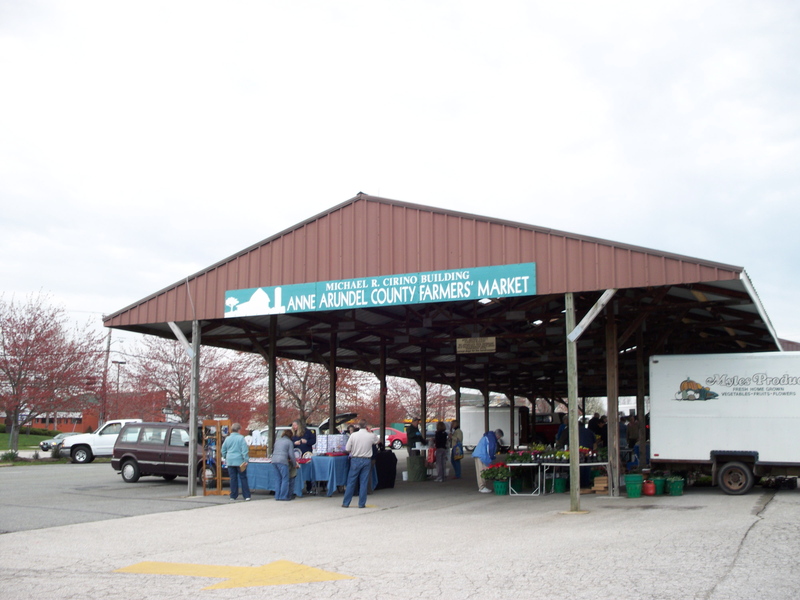 The Riva Road Farmer’s Market opens at 7:00 a.m. every Saturday. Click here to learn more about a Farmer’s Market near you and which items to expect to find each month as the booths become more crowded with the local harvest. I stopped by the library to find some books of poetry because this month is national poetry month and learned about the Anne Arundel County Public Library poetry contest. Start with “The lightning flashed, the thunder rolled”… and add no more than 20 lines. You can email your entry into Rhyme.or.reason.08@gmail.com or drop your entry off at the Annapolis Library. Entries will be published in Library Happenings (first names only!) and there will be prizes. Don’t forget to state your age bracket (5-12), (13-19) or (20+). Visit our website story on who knows, you might be inspired.